Can a news site draw more readers via a complementary wiki? Paul Bradshaw posted on E-Media Tidbits about the U.K. daily Trinity Mirror’s launch of what he describes as a wiki-blog hybrid at Wiki-North-East.co.uk from an idea from web developer Louise Midgley. Midgley, 28, who works for Trinity’s North-East division ncjMedia, won a cash prize and will also get a future share of any profits from her idea. 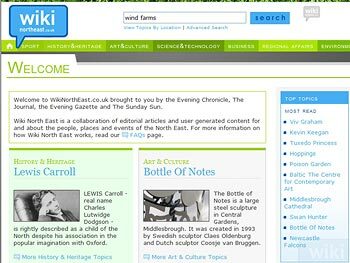 The wiki-blog features up to 12 years’ worth of digital archives documenting the North East England’s events and people that were not previously being used on ncjMedia’s sites. “I’ve written extensively on wiki journalism and its possibilities, and it’s great to see some experimentation in the U.K. However, at this stage there is a small problem: It’s very hard to find anything to edit. For instance, Wiki North East features several “topics,” such as Kevin Keegan or wind farms. But users cannot edit these topic overviews themselves — only the “articles” underneath them. To further confuse things, “articles” that are taken from the newspaper archive are not editable. Also, at the moment, those are the only articles I can find on the site. In other words, there’s nothing to edit. The result is something of a wiki-blog hybrid. This approach is puzzling. One of the reasons Wikipedia was so successful is that it did not start with nothing — it took content created in a prior (edited) incarnation, along with copyright-free encyclopedia material. Wikipedia also explicitly invited users to help with incomplete entries (”nubs”). -Make archive articles and topics editable. -Offer incomplete content that needs editing. In other words: Let go! Of course, the biggest challenge is building a community that cares enough about the site to repair the inevitable vandalism. Good luck with that. Actually, I like the interface of Wiki North East — it’s clearly more user-friendly and less dour than Wikipedia. Perhaps, for any news org, the proposition of assigning a few to manage the many Wikipedia-style may be too scary. Especially for smaller media companies trying to re-charge their sites with limited resources. The threat of suits also may be too high a price to pay for naively trusting everyone to play nice. Even Wikipedia has changed its policy on this, and the Los Angeles Times and The Washington Post have aborted free-to-critique projects after being deluged with crude comments from highly-motivated trolls. Wiki North East encourages readers to dig deeper for information in a site they can trust. Credible content is more link-worthy and baits advertising. The next step is for the project to constantly provide links to more contemporary stories/most-viewed stories on its current sites in the ncjMedia stable and vice versa and perhaps to link out to blog posts about the region.